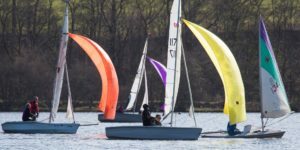 As you know we hosted a Scottish Team Racing Association event today, after the very damp day on Friday the forecast didn’t look good for Saturday. 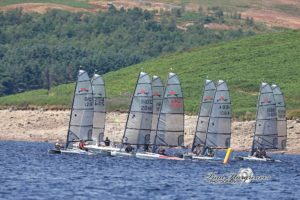 After a brief hail storm at the start of the racing, the day was actually mostly dry and sunny. However the wind was very temperamental and I suspect I wasn’t too popular with one of the students telling him that the wind usually increased between 12 and 1pm and then settled down ……oops, no it did not settle down at all, some horrendous gusts followed. 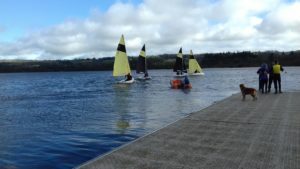 All the competitors ended up investigating the murky waters of Castle Semple Loch at some point during the afternoon. One poor guy hadn’t brought a change of clothes – but thankfully Arthur came to the rescue. Another female fell out of her boat and spent some time being rescued meanwhile their fellow team boat was seen to capsize. Peter revealed it was the first time in 6 years that he had capsized in a firefly – so that gives some indication of how gusty it was. However, a good time was had by all and they planned to head to a pub for the evening to recover. The Castle Semple Team of Arthur, Hugh, Peter and various crew were third out of 6 teams so a good result – well done!